A storm moving in from the Gulf of Alaska arrived Friday in Northern California, soaking the state's Redwood Coast for several hours. Rain increased from a light drizzle overnight to steady rain on Friday in the state's far north, forecasters with the National Weather Service said. In the San Francisco Bay Area, overnight light rain made for slick roads ahead of the morning commute. A mountain pass across the Sierra Nevada that runs through Yosemite National Park closed to traffic Thursday ahead of the storms expected to dump up to 2 feet of snow on the highest peaks, park officials said. Officials are asking drivers to be safe and prepared for this Winter-like storm by having chains on their vehicles. Despite the dangers, the early snow is a welcome sign for several ski resorts who hope to get several hundred inches of snow for the season. Resorts like Boreal Ski will be the first to open their ski area in the California for the 2017-2018 season. "It's incredible when we're able to open early," said Tucker Norred. "There's some seasons when we only 73 inches and there's others that we've had 750 inches." In fire-scarred regions of Northern California's wine country, meanwhile, crews were working to stem the flow of ash, soil or hazardous substances into waterways in case the storms bring heavy rains there. Tioga Road, the soaring eastern entry to Yosemite, was closed to traffic shortly before nightfall Thursday. Officials were also closing Glacier Point Road, which offers sweeping views of Yosemite Valley. Both roads are to be shut through Monday, when the storms are expected to dissipate and road conditions can be assessed. Two storm systems will be moving through Northern California over the weekend, bringing rain and snow to the region. Most of the rain is expected overnight Friday into Saturday morning. In Sonoma County north of San Francisco, crews have been working long days to prevent feared mudslides and water pollution in areas hit by last month's devastating wildfires, which killed at least 43 people and destroyed more than 8,900 homes and other structures. The work includes placing sandbags and bundles of straw to block runoff into streams, and moving to capture some of the runoff in urban areas that burned. California has declared a public-health emergency in fire areas in part out of concern that household chemicals from burned areas could contaminate soil and water. This weekend, up to 2 feet of snow are forecast to fall in elevations above 8,000 feet, and at least a foot of snow is expected in Donner and Tioga passes and other areas above 6,000 feet and up, forecasters said. The storms coming in from the Gulf of Alaska will also bring rain to the San Francisco Bay Area, including North Bay counties still recovering from last month's fires. The first storm will clear by Sunday afternoon. But a second storm system is expected to hit the area Sunday night. So far, the only Lake Tahoe-area ski resort open is Mt. Rose area on the Nevada side. But operators were pleased with the forecast. 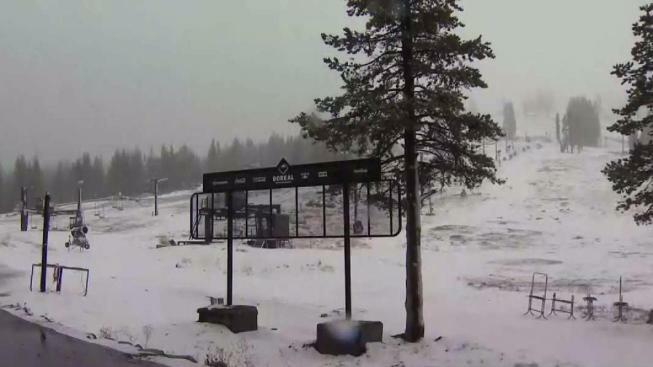 "We are so excited for the coming storms," said Marcie Bradley, a spokeswoman with Northstar Ski Resort in Truckee, which is scheduled to open Nov. 17.